Army children, along with other service or forces children, are sometimes the subjects of academic research. This page presents details of some current and recent research projects and, where appropriate, their findings. News of new research is always welcome. Jennine Hurl-Eamon, author of Marriage and the British Army in the Long Eighteenth Century: ‘The Girl I Left Behind Me’ (Oxford University Press, 2014, right), is embarking on a new project that will explore the interactions of British soldiers and children in the period from the Seven Years War to Waterloo (1756-1815). Inspired by recent work in the interdisciplinary field of childhood studies, the book will highlight children’s agency. Although the field of military history has broadened considerably in recent years, there has still been no attempt to investigate the army’s interactions with children in a period when Britain was at war more years than at peace. By presenting children as historical actors, Hurl-Eamon will not only investigate the impact of state and army policy on their lives, but will also stress how children shaped political and military events in turn. The latter aspect is most visible in smaller theatres of interaction, and has thus gone unnoticed by previous histories. It was present, for example, when a British officer inspired loyalty from the regiment by helping an orphaned child, or when a local child taught British soldiers foreign phrases at a posting abroad. ‘As the UK Armed Forces undergo unprecedented restructuring to deliver a new employment model, this report draws together what we know about how the families and children of Service personnel are supported to deal with the emotional and psychological impact of deployment and training. It examines the services already in place for families and identifies areas where more evidence, about both the need for services to support families and the effectiveness of these services, is necessary. The report, which has been endorsed by the Royal British Legion and Combat Stress, makes seven key recommendations. These include the carrying-out of further research into the psychological impact of deployment, alcohol misuse and servicewomen’s separation from their families on British service families; and recognition of the contribution made by service families to the functional capacity of the armed forces and of the practical and emotional impact on them of caring for injured service personnel. To learn more about the report, click here. 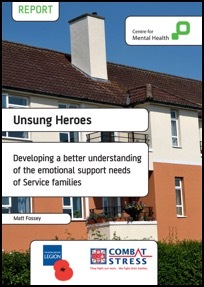 And to read or download the report itself, click on this link: http://www.centreformentalhealth.org.uk/ pdfs/unsung_heroes.pdf. A new study focusing on the health and well-being of forces children is about to get under way. Expected to run for three years, it will be led by researchers at the King's Centre for Military Health Research (KCMHR). Read on for further details. 'The Institute of Psychiatry, King's College London, is delighted to announce that the US Department of Defense has given nearly £1 million (1.7 million USD) funding to study the health and well-being of children whose fathers either are, or have been, in the UK armed forces. Dr Amy Iversen, who will be leading the research with Dr Nicola Fear, both from the King's Centre for Military Health Research, said: "The US Department of Defense felt this was an area in which they would like to conduct further research and were encouraged by the fact that the Institute of Psychiatry has a cohort study of military fathers who had given permission to be involved in further research". The research aims to better understand the effects of paternal deployment, and possible subsequent paternal mental-health problems, on children of UK armed forces personnel. They will examine a wide range of health and well-being issues in military children, including mental health and school performance. Dr Iversen continues: "This is an exciting piece of research as we know little about the impact of fathers' well-being on children's development and it is particularly interesting in the military context with the added challenges of separation due to deployment." The findings of a report based on an in-depth study of the challenges faced by children with a parent in the armed forces commissioned by the Royal Navy and Royal Marines Children's Fund were published on 5 November 2009. Researchers having examined 'all current thinking and UK/US academic research on the topic' and interviewed 'Naval children, parents, child psychology experts, other service charities and opinion-formers' for the report, entitled 'The Overlooked Casualties of Conflict', the Royal Navy and Royal Marines Children's Fund concludes that 'children of service personnel are struggling with a unique set of challenges caused by the service lifestyle but their needs are being frequently overlooked'. It also predicts that: 'we are sitting on a ticking timebomb of problems for children whose parents have served in Iraq and/or Afghanistan'. only 16 per cent of UK adults think that service children are 'significantly affected by their parent being deployed to a warzone'. Both the report, including details of its recommendations for further research and better understanding of the impact of service life on children, and the press release that accompanied the report's launch can be downloaded from the Royal Navy and Royal Marines Children's Fund's website: http://rnrmchildrensfund.org.uk/research. As well as being the founder and chair of the Service Children Support Network (SCSN), Joy O'Neill is also the chair of governors at Halton School, a primary school in Buckinghamshire, at which, in 2008, she undertook research that led to the implementation of a one-year pilot project designed to support the needs of service children at the school during periods of mobility (i.e., when joining or leaving the school), and while their parents were deployed overseas. Click here to read about the project and about Joy’s findings. Current forces families may be interested in taking part in a new research project, the first of its kind focusing on what daily life is like for parents in the armed forces and their children. More information on the 'Family Life and the Armed Forces Study' follows. 'Katherine Shelton, a researcher at the School of Psychology, Cardiff University, is looking for parents to participate in a research study on family life and the armed forces. Any parents (mothers and fathers) of school-aged children (5-16 years old) are invited to take part. Children aged 11-16 years old are also able to take part, if their parents are happy for them to do so. The aim of the study is to learn more about family life. We are interested in how parents and children respond and cope with day-to-day positive and negative events that happen at work, at school and at home. We would like to learn more about what matters for individual and family well-being where one or both parents are serving in the armed forces. This study is the first of its kind to focus on everyday life for parents and children in the forces. If you (and/or your partner) decide to take part, you will be asked to complete three questionnaires over the next eighteen months. Each of the questionnaires would take no longer than 45 minutes to complete on each occasion. Questionnaires will be posted to you with a prepaid envelope for returning them once they are completed. If any of your children who are aged 11-16 years old would like to fill in a questionnaire and you are happy for them to take part, then a questionnaire will be sent to them too. WHAT HAPPENS TO ALL THE INFORMATION? Any information that you and your family provide will be treated as strictly confidential and at no point in time will your names be associated with the findings of the study. The information that you provide will be held at Cardiff University and only the research team will have access to the information. Should you decide to take part, you will be free to withdraw participation at any time. Dr Grace Clifton, staff tutor in education at the Open University, has been researching the educational experience of army children attending secondary schools in the UK since 2002. She sums up her main conclusions in the abstract below. To read more, click here. Dr Grace Clifton, the Open University. In 2008, Aggie Robertson conducted some research into the education of armed forces children in British state schools. As part of this research for her education-studies degree, she asked former army children to share their experiences with her through various online forums, as well as through TACA. Her dissertation now being complete, Aggie summarises her findings below. 'The research highlighted the fact that schools are not very supportive of army children, mainly because of a lack of understanding or a level of ignorance that stems from prejudiced views held on army children. Just because the child might not be in the school for long is not an excuse to minimise input. Schools, however, can provide a stable environment in a turbulent time. The children will come to school often during term time after having left friends behind and with the high possibility of a parent being deployed at short notice. The Department for Education and Skills (DfES) (2003) recognises that starting during the year may have an impact for some time. Schools can ease the transition by providing "buddies" to help the child settle in. I would recommend support lessons, especially for older children who have exams coming up, which would help to close the educational gaps often present because of frequent postings and different exam boards. Raising awareness of army life through displays and literature could reduce prejudice and bullying. The children come to school with a wealth of experiences that the school could build on; an indication of where the child has lived on a globe could teach the "stable" children about those countries and cultures. The Service Children in State Schools (SCISS) team has put together a handbook to support schools, which refers to the Service Children's Education (SCE) Toolkit, used by overseas service schools as a resource to help army children, where staff are used to dealing with high mobility and the emotional turmoil that comes with army life and deployment. It is also important to support the child when he/she is due to move to a different school, as suggested by the DfES (2003), which recommends a positive exit programme. The department also suggests putting an induction mentor in place for mobile pupils to ease the transition, and to provide a link between parents and school. The forums indicated the need for a support network, where adults can share their experiences. The replies suggested that many still find it hard to settle in one place or job and feel the need to move every two to three years. They tend to have problems with forming close relationships and often feel "lost". Some felt that they came from "everywhere and nowhere", which reflects the issue of "rootlessness" and a failure to connect to new places and faces (Clifton, 2007), although they easily adapt to new situations. The gaps in education can also mean an inability to reach full potential in later life, where careers would have been affected due to a disrupted education. Many older participants, however, look back on their childhood with nostalgia and enjoyed the travelling around and the experiences related to it. Everyone experienced his or her childhood differently and it would be wrong to generalise. Army life has shaped them in a unique way. There are many issues that I have been unable to examine in more detail, but each would be worthy of a separate study. It would have been interesting to compare state schools with SCE schools, as would it have been fascinating to compare army children with other minority groups, such the Gypsy Roma Traveller group. Each of these has been researched in depth, and as a result inclusive practices and strategies have been put into place and published by the government. Clifton (2004) states that the Ministry of Defence (MoD) has so far failed to fund any significant research into the educational experiences of service children, although the department does recognise that the welfare of the family influences the effectiveness of serving personnel. Soldiers from the Territorial Army are now more likely to be deployed to hostile areas, and I am concerned that schools are not prepared for the possible emotional effect that this can have on the child and the family who has no support from an army families officer. More and more serving soldiers return from Iraq and Afghanistan with emotional and physical scars, or even lose their lives. The impact that this will have on a large group of children will be immense, with irreparable consequences unless plans and strategies are put into action immediately to help army children cope in the near and distant future. Department for Education and Skills, Managing Pupil Mobility: Guidance (2003)[online text: http://www.standards.dfes.gov.uk/sie/documents/pmguidance. pdf]. According to 'Born Abroad', a not insignificant number of individuals recorded in the 2001 census were born outside the British Isles because their parents were British forces personnel who were stationed abroad at the time. These individuals include those born in Cyprus (77,156 people in total being recorded in 2001), and particularly those who were born in Germany (262,276 individuals, or about 0.5 per cent of the population, making this the third most common country of birth outside the British Isles). Moreover, included among the top five clusters of places where Germany-born people were living in 2001 were Wiltshire, Colchester (Essex), North Yorkshire and Aldershot (Hampshire), in other words, places where there are major army bases. 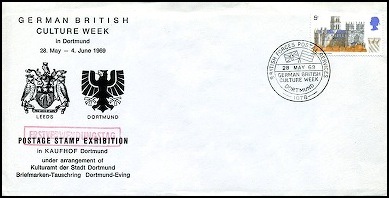 Above: A first-day cover commemorating the 'German British Culture Week' that was held in Dortmund in 1969. The British city of Leeds has been twinned with Dortmund, a city in the Ruhr area of Germany, since 1969. Their parents' military career has resulted in many British individuals having personal, and often family, links to a particular town or region of Germany. Click here for an aerial view of British Military Hospital (BMH) Iserlohn, where many of those army children who were born in Germany came into the world. Further BMHs in (West) Germany included those located in Berlin, Hannover (Hanover), Rinteln, Hamburg, Hostert and Münster. 'Historical documentation relating to life in the British Army shows that married soldiers could be divided into two categories. Firstly, a soldier could marry with his commanding officer's permission, which would ensure that his marriage was recognised – his wife and children would be allowed to live in barracks and would be provided for by regimental funds. This was known as marrying "on the strength" as the wife was able to exist "on the strength" of the regiment (Trustram, 1984; Venning, 2005). The number of marriages that received the permission of the commanding officer was limited so that the regiment would not have to provide for too many dependants, with estimates suggesting that only 6 per cent of the soldier population was permitted to marry "on the strength". Marriages not receiving the permission of the commanding officer meant that wives and children lived beyond the life of the barracks and often had to eke out a difficult existence with little or no money provided by the serving soldier. It is quite possible that this is the earliest recorded use of the term "brat" specifically in relation to military families (although it should be noted that "brat" is a pejorative term that could be used to refer to any child). At the end of the eighteenth century, the term "barrack rat" was used in the United Kingdom (Richards, 2003). Various stories about life as a child in army barracks can be viewed at the British Army Child archive [The Army Children Archive, TACA] (see http://www.archhistory.co.uk/taca/ livestimes.html [and elsewhere on the http://www.archhistory.co.uk website]). It is entirely possible that the term "barrack rat" was constricted to become the term "brat" that we know and use today, although Ender (2002) suggests that "brat" could be an acronym of the term "British regiment attached traveller", which would certainly fit the history of army children being seen to be "on the strength" of the regiment. In the United Kingdom, the term "pad brat" is sometimes used in preference to "military brat" – with "pad" referring specifically to the quarters or accommodation provided by the army for use by the families of military personnel. ENDER, M (ed), 2002, Military Brats and Other Global Nomads, Westport, USA, Praeger Publishing. JEFFARES, J (ed), 1973, George Farquhar: The Recruiting Officer, Edinburgh, Oliver and Boyd. RICHARDS, F, 2003 (reprint), Old Soldier Sahib, Uckfield, Naval and Military Press. TRUSTRAM, M, 1984, Women of the Regiment. Marriage and the Victorian Army, Cambridge, Cambridge University Press. © Dr Grace Clifton, the Open University, & Dr Becky Powell, US Army, Germany. Listed below are details of researchers whose work often focuses on army children. TO READ A SUMMARY OF DR GRACE CLIFTON'S RESEARCH INTO THE EXPERIENCE OF EDUCATION OF THE ARMY CHILD, CLICK HERE. CLICK HERE FOR A SUMMARY OF JOY O’NEILL’S PILOT PROJECT DESIGNED TO SUPPORT THE NEEDS OF PRIMARY-SCHOOL-AGED SERVICE CHILDREN DURING PERIODS OF MOBILITY AND PARENTAL DEPLOYMENT.